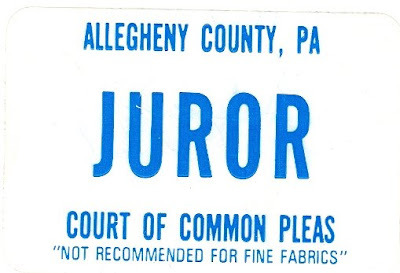 Daryl got this juror sticker from one of his coworkers who had jury duty. I must say, besides the quotation marks, what I really love about this is the implication that less fine fabrics can become jurors. YES! My sticker! Everyone was required to wear these stickers; they made me giggle all through jury duty. To be fair, I wouldn't want a juror anywhere near my fine fabrics either. It's a well-known fact that juror stains are really hard to get out. Oh, I think I figured it out. Does it mean you can't put that sticker on your nice clothes that you have to wear to jury duty? If you have jury duty, wear crappy clothes. ... because satin jurors are way too slippery, others are too woolly, and silk ones expect delicate treatment. Jurors mostly need to cotton on to the need to be all-natural.